Hello everyone!!! I’m here today to show you a new marker storage solution that is coming your way soon! I was first introduced to Deflecto’s New Interlocking Marker Organizer at Creativation. 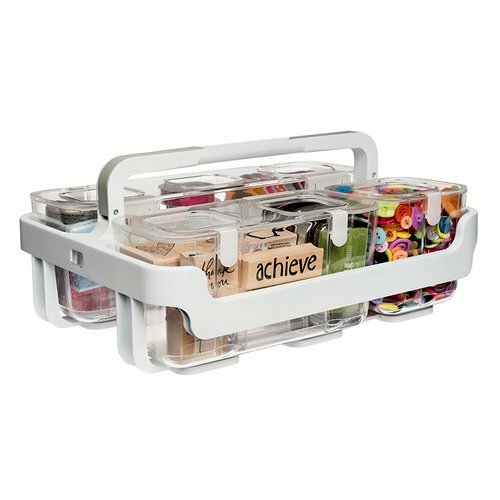 I was in awe when I saw this new organizer. Yayyy!! Look at that site! That’s my new caddy with the interchangeable storage bins. Each bin features a soft gray compartment that holds each marker neatly. They fit into the Stackable Caddy Organizer. This storage bin stores up to 20 markers or other long stemmed items. I add my watercolor pencils in a bin as well. Each bin can stand upright or horizontal. The interlocking dovetail allow you to create your ideal storage by connecting other bins. The are easy to store and move around. You can create with one bin or all of them. So what do you think? Will you store your markers in this manner? I would love to hear from you. I need that. Thanks for the post. Hey Lisa!! You are quite welcome!! I love this new marker storage.